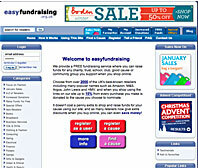 easyfundraising.org.uk is a shopping website which gives donations to charity. The Friends of Raymond is registered with them, and receives a donation every time you shop on-line using easyfundraising.org.uk – it links to over 2000 retailers. It doesn’t cost you any more to buy your goods – the donation is given by the retailer from their sales. Got to www.easyfundraising.org.uk and create an acount for yourself. When you do this you are given the option of which charity you wish to support – type in ‘Raymond’, and you will find us. You can also choose to sign up for Gift Aid for all your ‘donations’ to Friends of Raymond – extra money for us at no cost to you. Once you’ve created your account, the rest is very simple. When you decide, for example, to buy book or DVD from Amazon, all you have to do is navigate to the easyfundraising website and log in. Then go to Amazon to place your order. Give it a go – remember, it will cost you nothing, and benefit The Friends of Raymond.